The first time I visited Haiti was during my senior year at Sewanee: The University of the South on a medical outreach trip. I remember vividly winding down the road on a tap tap from Cange back to Port-au-Prince while having a conversation with a friend about how grateful we were to live in a country with infrastructure. At the time, I remember returning from the trip feeling a little helpless. What was I supposed to do? I was now armed with the information that most of the world does not experience life and its abundance the way that I do. There did not seem to be much justice in that. As I prepared to go to Haiti this time around, with Harvard-Westlake School and St. Matthews Parish School, I wanted to make sure that I accomplished something on my journey. Fortunately, I was put in touch with Cole Kawana, who showed me how to use the filter that I would take with me to Haiti. The road to St. Paul’s school looks more like a goat trail than an actual road. Bouncing around in the back of the SUV I realized that the trek into town (Cange) is quite an effort no matter whether on foot or automobile. This thought was confirmed by several teenagers in the community that described a two-hour walk each way to go to high school. 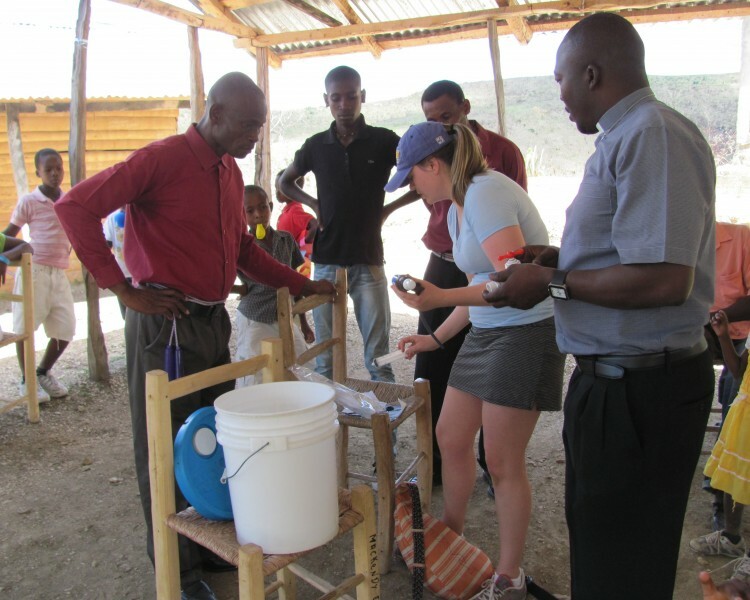 Pere Lazard, our guide and Episcopal priest in this general area, gathered the schoolteachers and administrators so I could show how to set the filter up as well as how to clean the water filter. In about ten minutes with translation help from Pere Lazard, with some acting out of my words thrown in, I had demonstrated how to use and clean the filter. In a place where water is relatively abundant, but not safe to drink, this filter in its simplicity is a godsend. Moreover, it was wonderful to leave the filter in the school, which is the nucleus of this particular community, because water became one less worry. Pere Lazard declared “One filter for every school! !